The Claw, #153, is arguably the most popular and iconic M.U.S.C.L.E. figure. A Purple #153 is likely the most desired and valuable colored poster figure. While no other #153 is remotely as valuable they colored Claws still manage to command a premium compared to other M.U.S.C.L.E. figures. This auction, M.U.S.C.L.E. 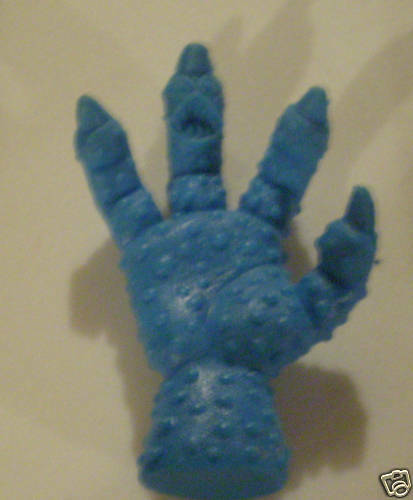 men Claw Hand blue figure, gives us the opportunity to watch a single color #153 on the open market. The auction’s picture and description do little to add clarity to the true condition of the figure, which may negatively impact the final price of the auction. 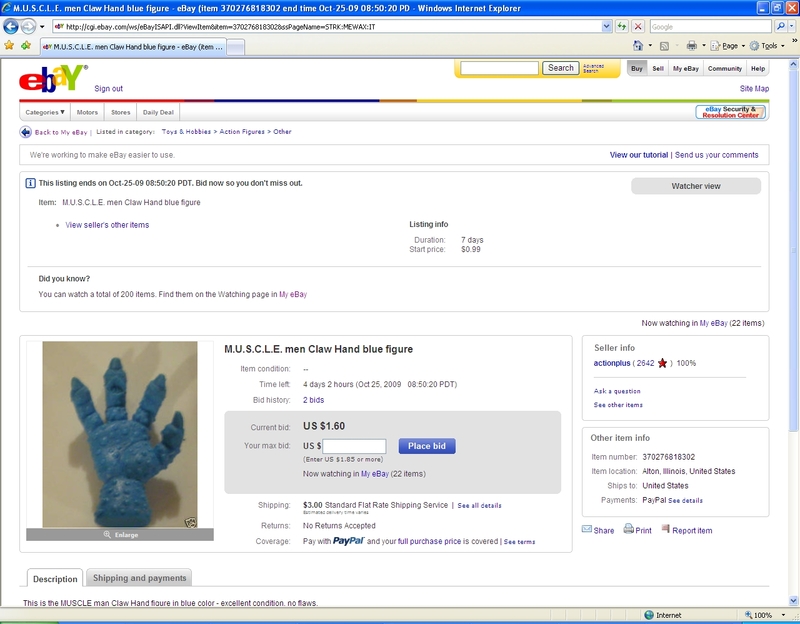 However, an enticing starting bid of $0.99 and fair shipping price will likely offset the poor description and picture. This figure could easily sell for $5 and will likely sell for between $6~$7. The only thing that could push it higher would be a bidding war between impatient and/or inexperienced collectors. Follow-Up: The final price for this auction was $5.02. Less than predicted, but still a fairly ordinary price for a #153 figure. This entry was posted on Wednesday, October 21st, 2009 and is filed under Auction Watch, UofM News. You can follow any responses to this entry through RSS 2.0. You can skip to the end and leave a response. Pinging is currently not allowed. I was one of the losing bidders on this. Still kind of bummed I lost, as I like the hand in blue and don’t see him often. But that’s what happens when you don’t keep an eye on auctions in the finals seconds. Auction Watch #24 « University of M.U.S.C.L.E. 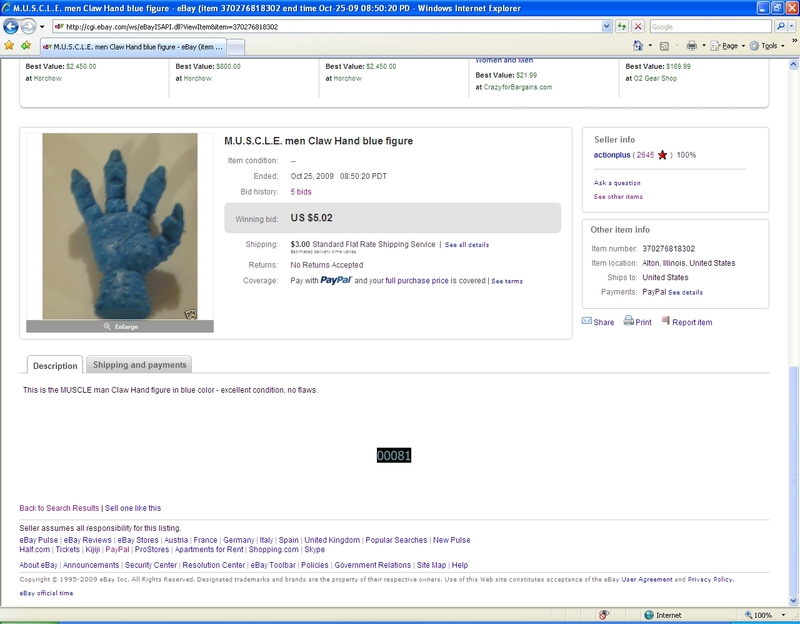 Auction Watch #86 - Interesting M.U.S.C.L.E. Auctions | University of M.U.S.C.L.E.